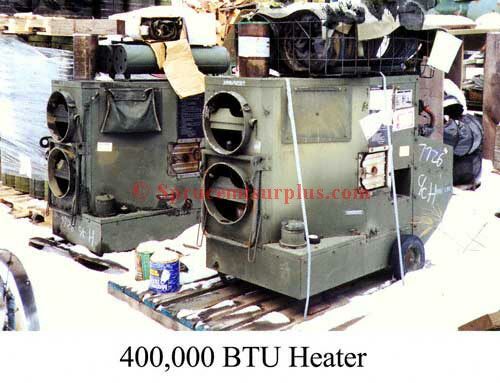 Premium Genuine Issue U. S. Military Surplus. Including, United States Army, U.S. Navy and U.S.M.C. 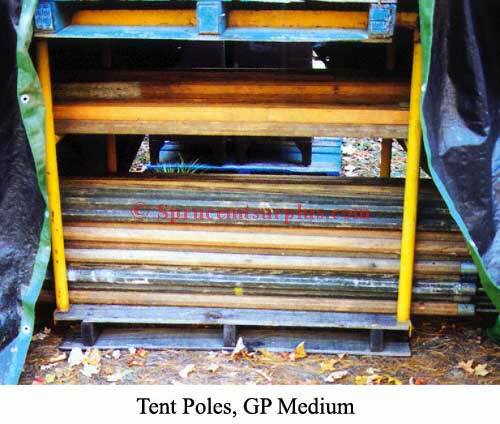 New Old Stock, Current Issue And Also Some Used. This page can take a long time to load. Please be patient, we have many items. 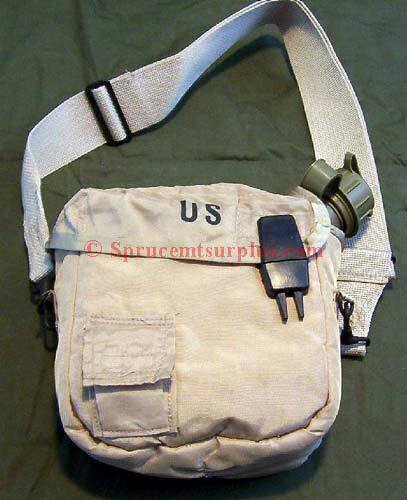 Bag, protective magazine. NSN 1005-052-6942. New old stock. Mfg in 1970. Mfg of clear ethylene vinyl acetate copolymer. 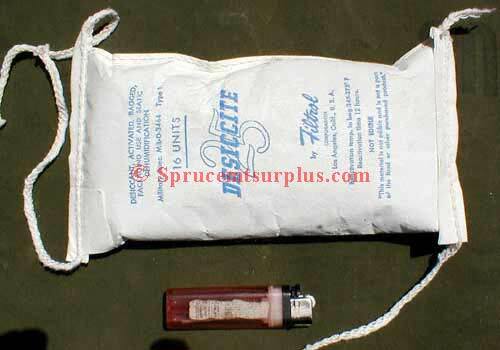 Also known as the "chieu hoi" bag. 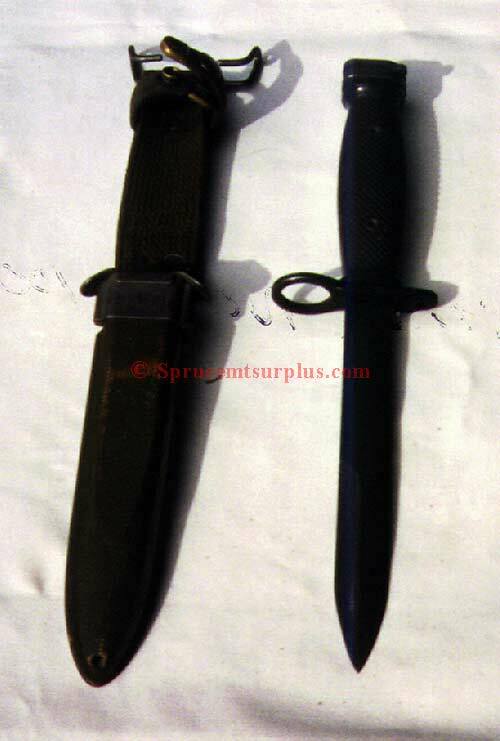 Bayonet, M -4. 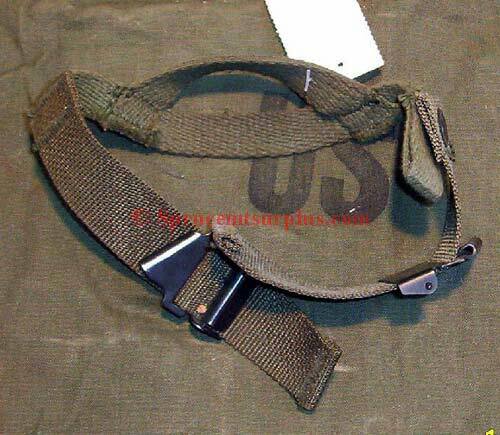 For the M-1 Carbine. New old stock in the original wrap. Does not include sheath. Bayonet, M-5. 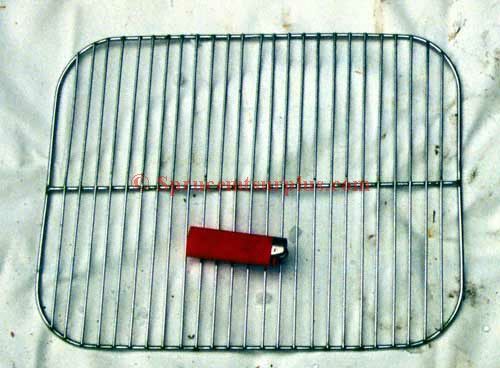 For the M-1 Garand. New old stock in the original wrap. 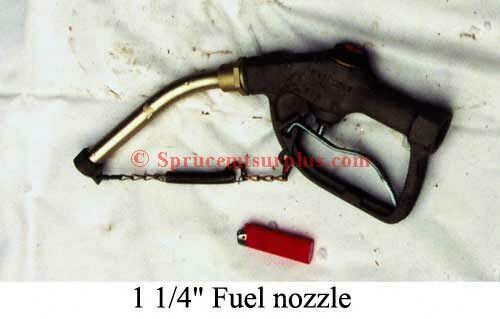 Does not include sheath. 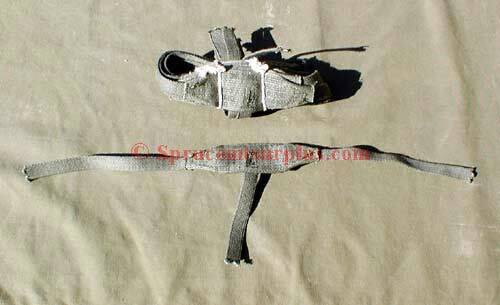 Scabbard, M-10. New old stock. Scabbard, M-8A1. Used good condition. 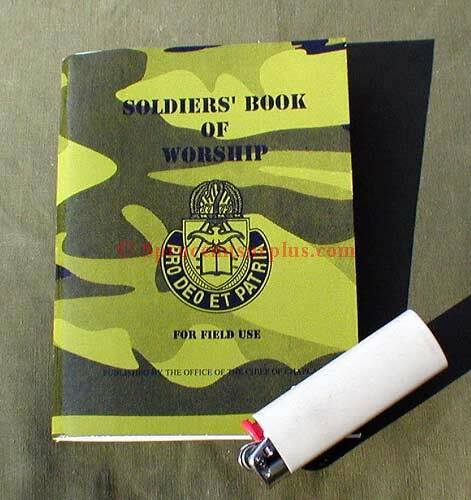 Soldiers book of worship for field use. New old stock. New Testament, Psalms & Proverbs. New international version. 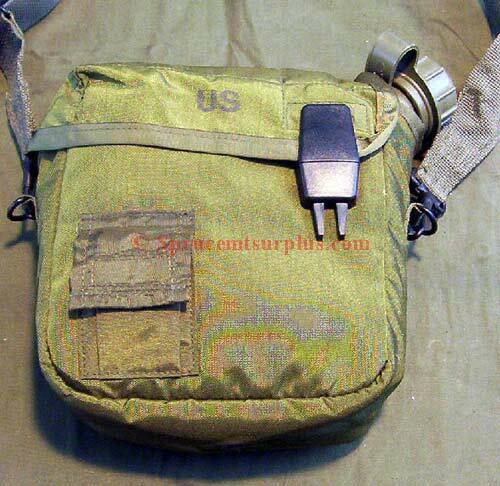 Pocket size with woodland camo cover. New surplus. 15 . 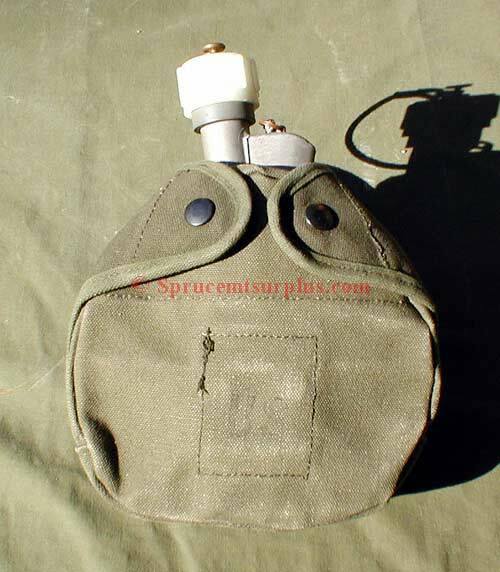 Canteen Canteen Covers and Hydration Carriers are on the Canvas Goods page. 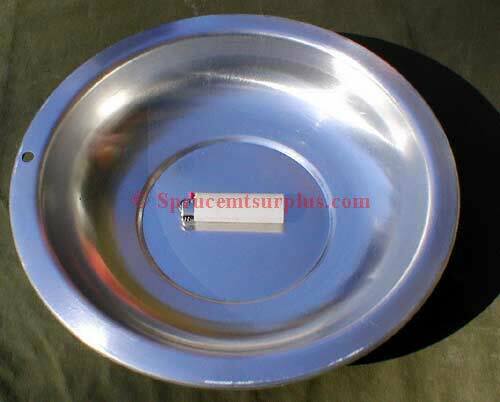 Stand, canteen cup. NSN 8465-01-250-3632. New old stock. 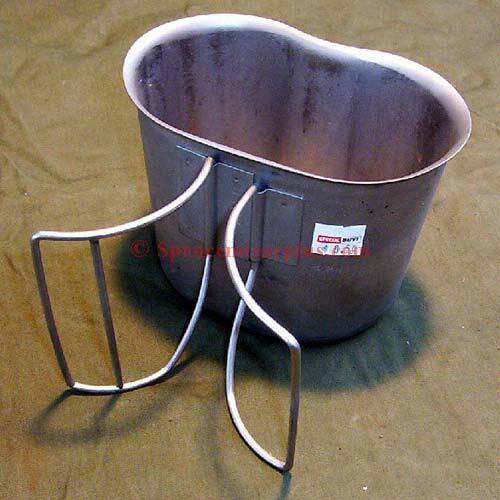 Canteen cup, wire handle. Used, very good condition. 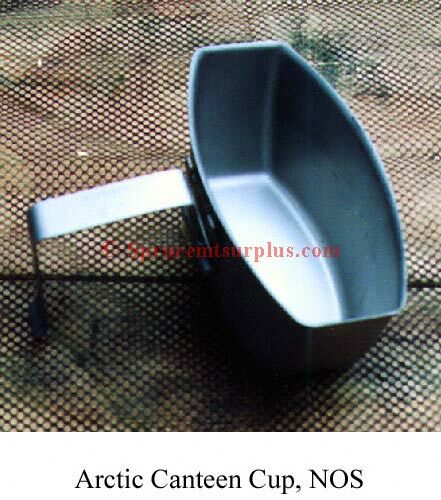 NBC canteen cap for 1 qt and 2 qt canteens. New old stock. 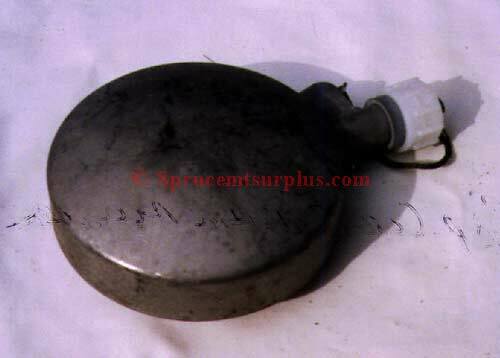 Standard canteen cap 1 qt and 2 qt. Plastic. New old stock. 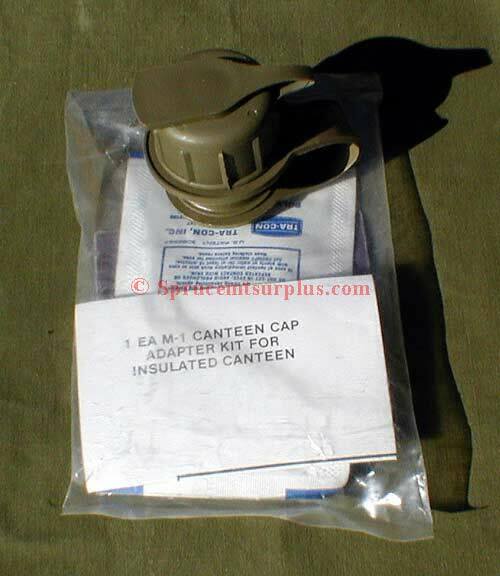 Adapter kit to convert arctic canteen spigot to M-1 canteen cap with gasmask drinking tube. New old stock. 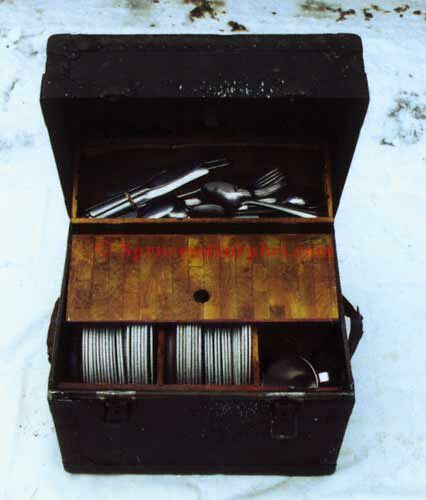 Arctic canteen set complete. New old stock. NSN 8465-00-753-6489. Arctic canteen cup. New old stock. 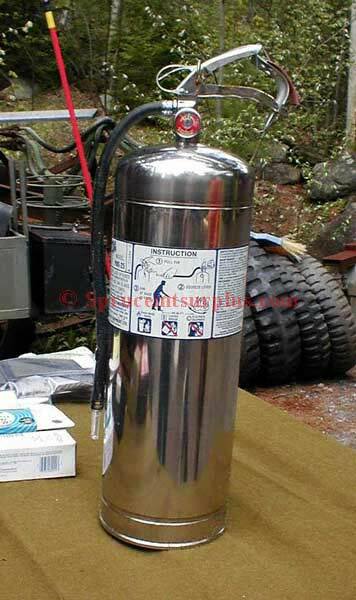 Canteen, 2qt, plastic, used good condition. 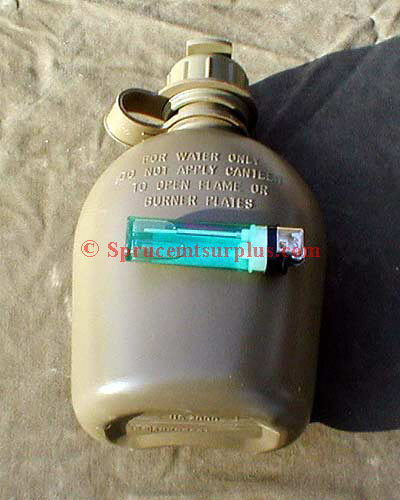 Canteen, 2 qt set. 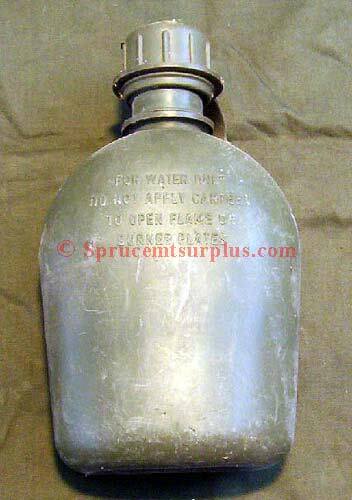 Green cover, NSN 8465-00-927-7485, new old stock and new 2qt canteen with drinking tube cap. 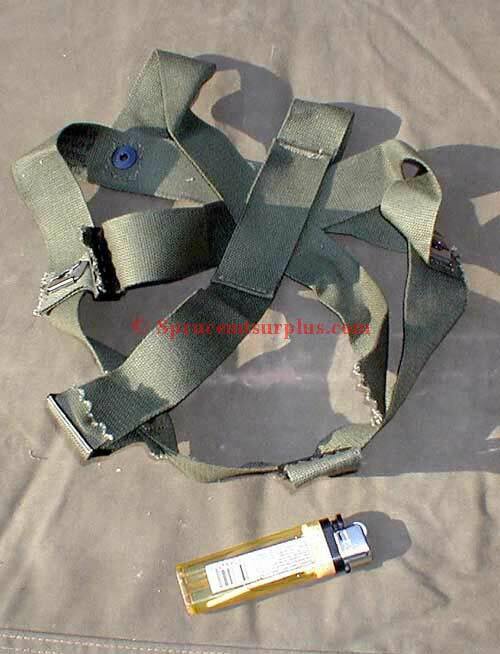 Also comes with green general purpose carry strap. 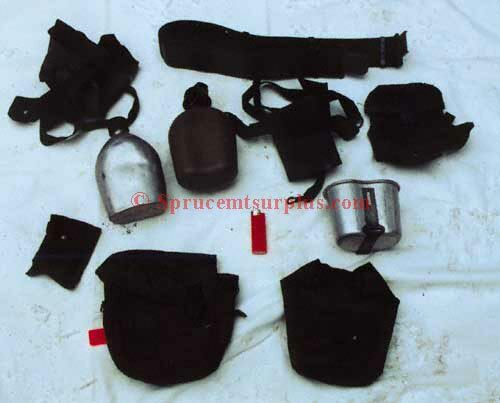 Canteen, 2 qt set. 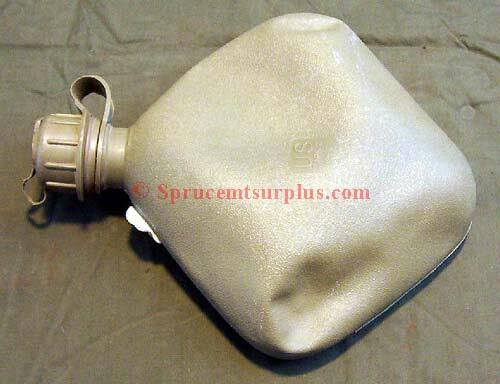 Tan cover, NSN 8465-01-118-8175, new old stock and new 2qt canteen with standard cap. 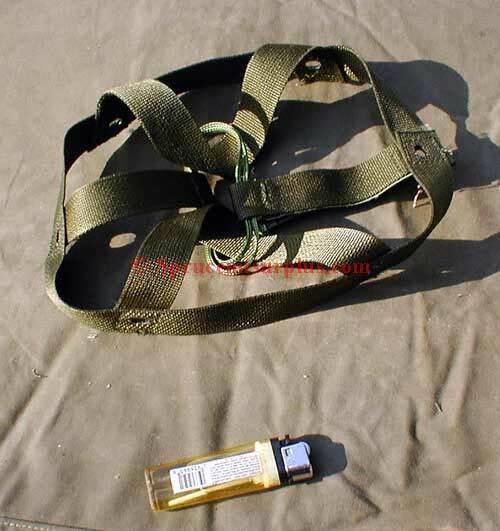 Also comes with tan general purpose carry strap. Chemical light sticks. Orange, Red, Blue, White, Yellow, Green. Mfg by Omniglow. 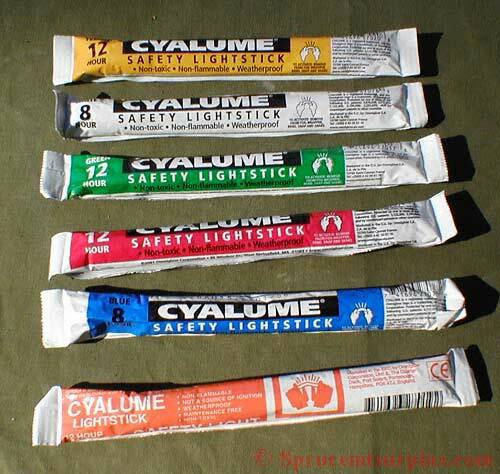 Also, see Cyalume. Comb, unbreakable. Made in the USA. 5" pocket size. 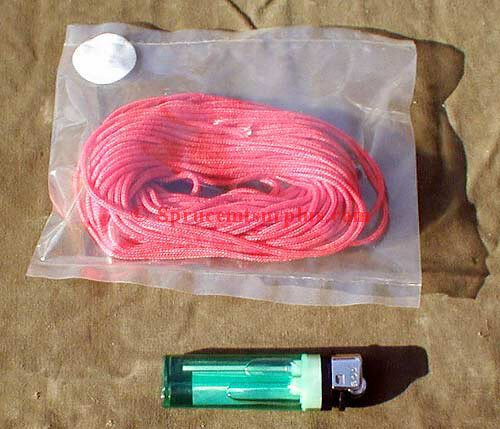 550 cord, cutoffs from parachutes. 50 '. 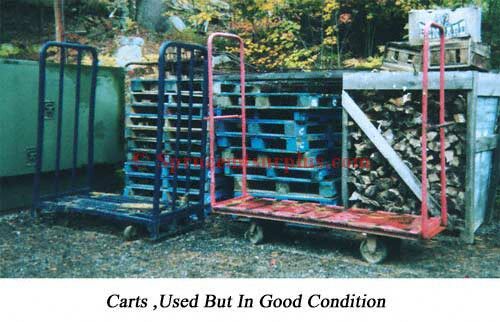 Used excellent condition. Throwing line, aka shooting line. 50' orange stranded line. 3/16". New old stock. 550 cord. 100 ft. MIL-B-540, type 1-B-11. New surplus. Light, chemiluminescent. Green, 6 inch, 12 hour. NSN 6260-01-074-4229. Mfg by Cyalume Technologies, Inc. AKA, chem-light or lightstick. OmniGlow. Light, chemiluminescent. Red, 6 inch, 12 hour. NSN 6260-01-178-5559. Mfg by Cyalume Technologies, Inc. AKA, chem-light or lightstick. OmniGlow. Light, chemiluminescent. Yellow, 6 inch, 12 hour. NSN 6260-01-196-0136. Mfg by Cyalume Technologies, Inc. AKA, chem-light or lightstick. OmniGlow. Light, chemiluminescent. Blue, 6 inch, 8 hour. NSN 6260-01-178-5560. Mfg by Cyalume Technologies, Inc. AKA, chem-light or lightstick. OmniGlow. Light, chemiluminescent. White, 6 inch, 8 hour. NSN 6260-01-218-5146. Mfg by Cyalume Technologies, Inc. AKA, chem-light or lightstick. OmniGlow. Light, chemiluminescent. Orange, 6 inch, 12 hour. NSN 6260-01-195-9753. Mfg by Cyalume Technologies, Inc. AKA, chem-light or lightstick. OmniGlow. Magnetic lightstick holder. NSN 6260-01-255-3346. 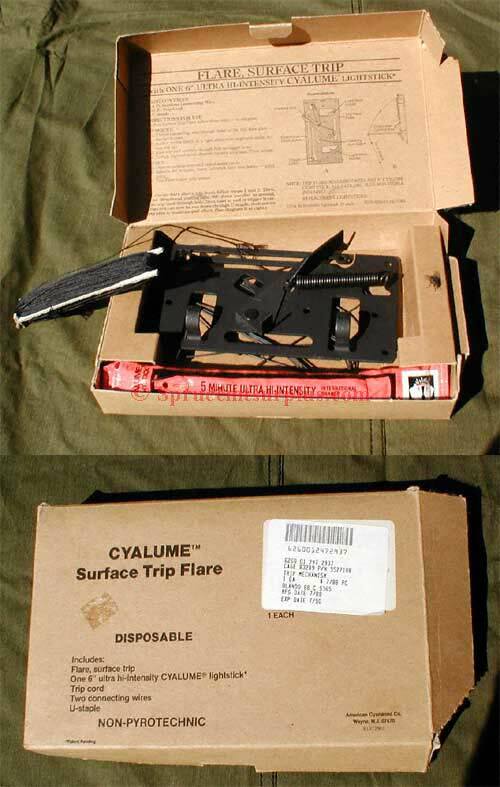 Mfg by Cyalume Technologies, Inc.
Shield, lightstick holder. 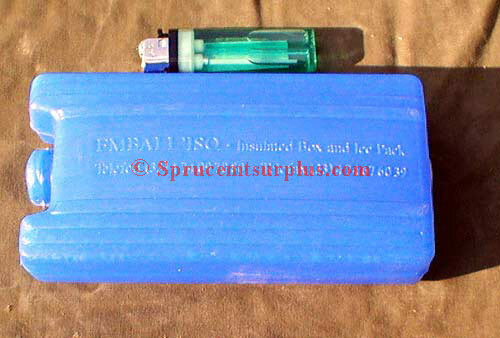 OD green, plastic holder with multiple attachment points for holding and shielding Cyalume chem-lights. Mfg by Cyalume Technologies, Inc. and others. 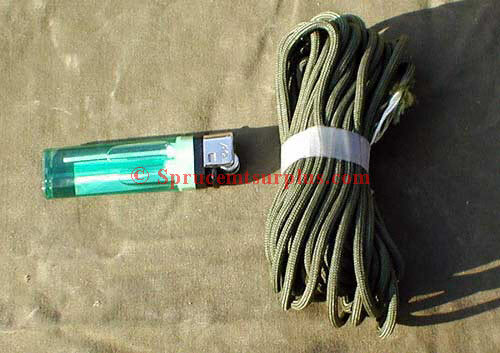 Personnel Marker Light with whistle. PML. NSN 6260-01-086-8077. Current Mfg. Mfg by Omni Glow Corp./ Cyalume Technologies Inc. Call for 50 count priceing. Marker, ID. NSN 7690-00-095-1653. New old stock issue. Reads, Caution. Open petcocks on top of radiator when adding coolant. After system has been completely filled, close petcocks. Black lettering with black border on yellow background. Marker, ID. NSN 7690-01-111-2265. Part # 12302516. New old stock issue. 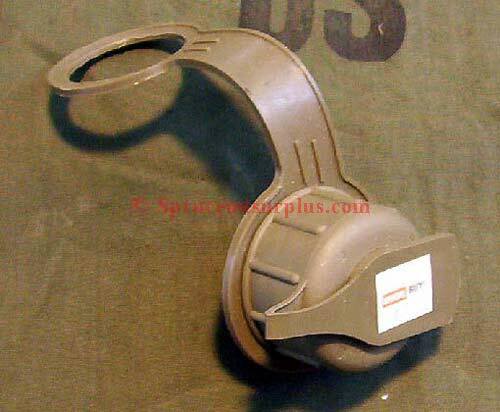 Reads, Caution Add Silicone Brake Fluid Only MIL-B-46176. Black lettering on yellow background. Marker, ID. NSN 7690-01-114-3702. New old stock issue. Reads, Warning. 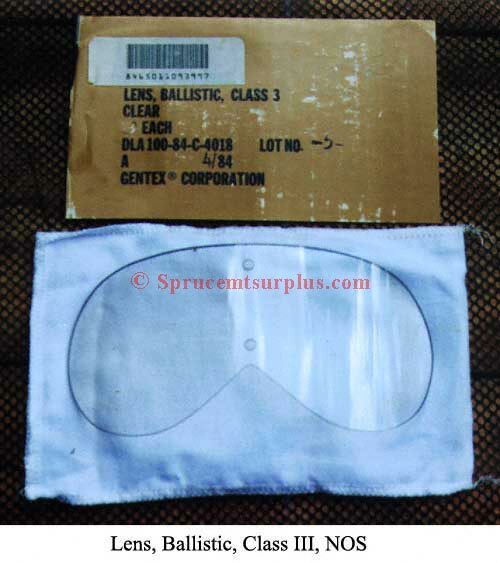 If NBC exposure is suspected, all air filter media will be handled by personnel wearing full NBC protective equipment. 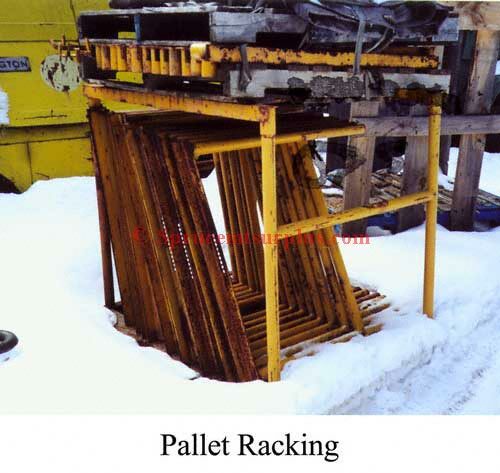 See operator/maintenance manuals. Red, black and white on white decal. 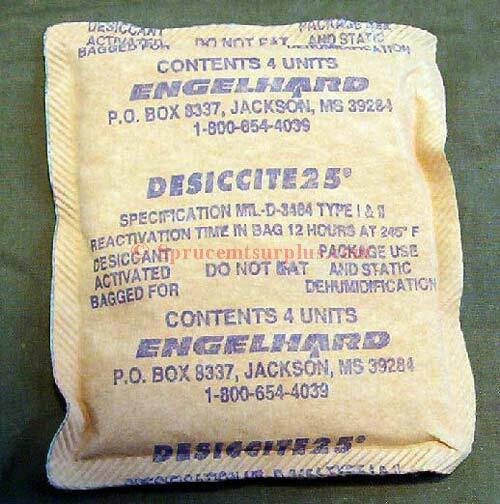 Desiccants, activated bagged, type 1. 16 unit bag. 1 lb 7 oz. each. NSN ????-00-264-6572. MIL-D-3464. New old stock. Mfg by Filtrol. Desiccants, activated, bagged. 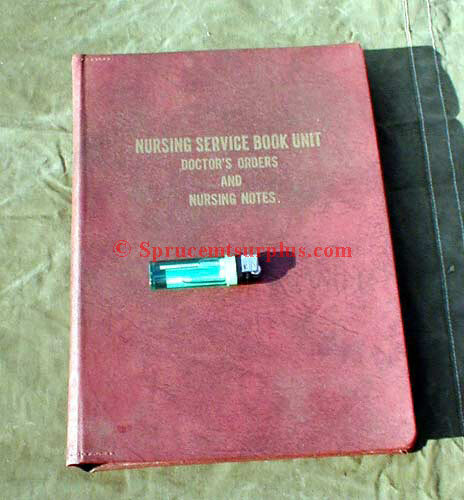 Desi-Pak, 8 unit, type 1 and 2. Mil-D-3464. Weighs approx 5 oz. Mfg by United Desiccants. New old stock. 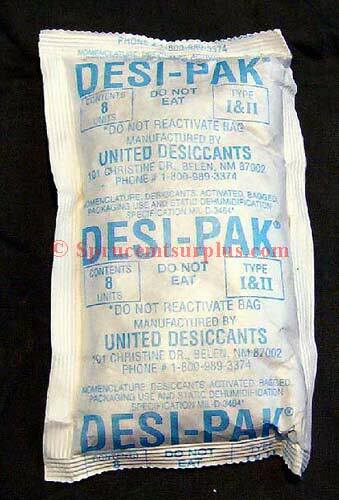 Desiccants, activated bagged, 1/2 unit size. NSN 6850-00-935-9798. 450 pieces packed in a 5 gallon can. New surplus. 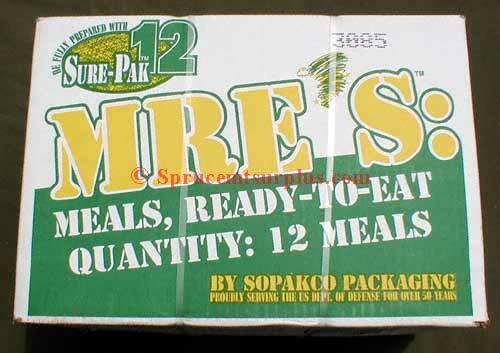 $7.00 out of box additional charge. 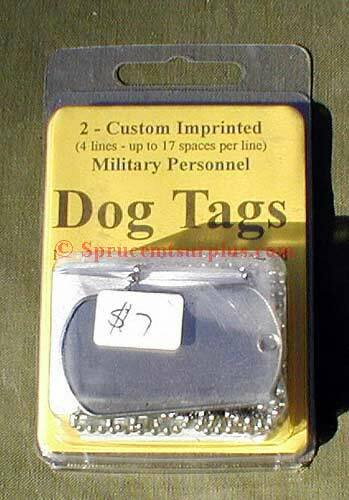 Identification tags. Order form, self addressed envelope, directions, 2 tags and chain. Eraser, blackboard. NSN 7510-00-244-9145. Model ESPO1, all felt, sewn. 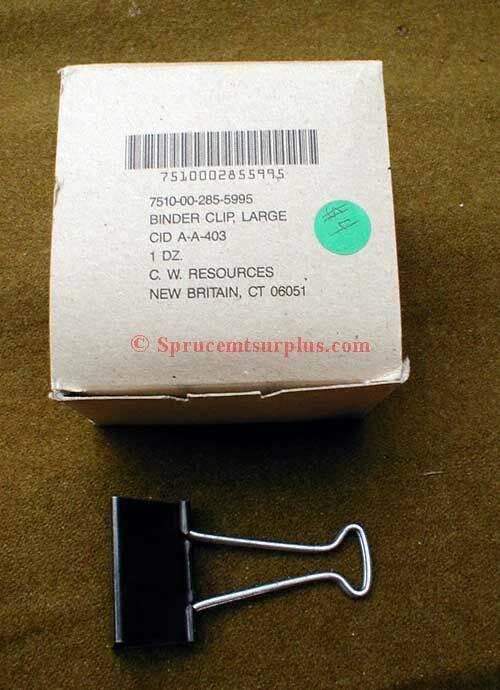 NOS (new old stock).12 ea per package. 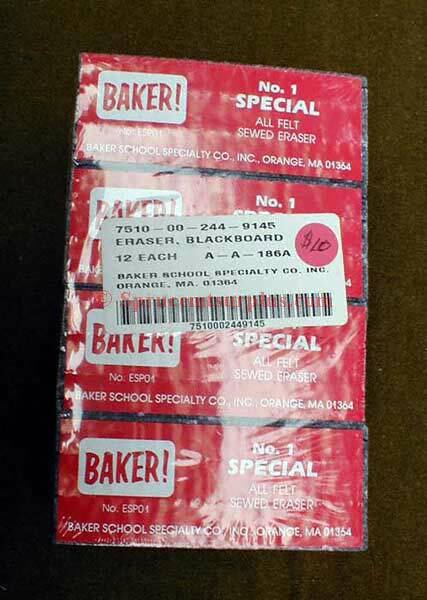 Mfg by Baker School Specialties CO, Inc. File, Visible Index, Book Unit. NSN 7460-00-299-9492. 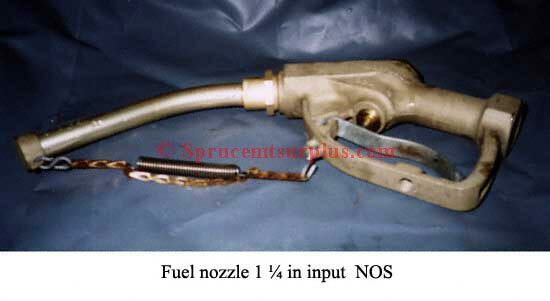 NOS(new old stock). Nursing service and doctors orders. 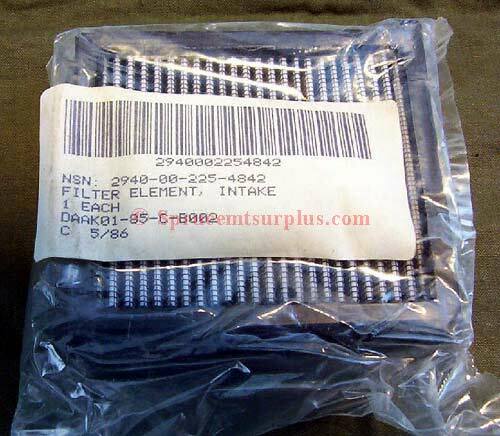 Filter element, intake. NSN 2940-00-225-4842. New old stock. For the 1A0 series engines. 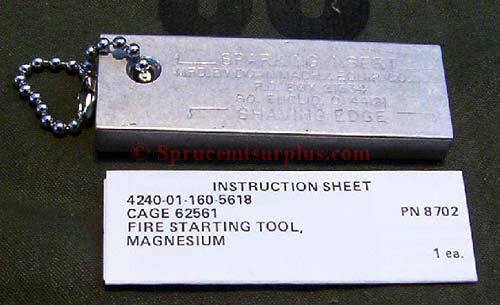 Fire starting tool, magnesium. NSN 4240-01-160-5618. 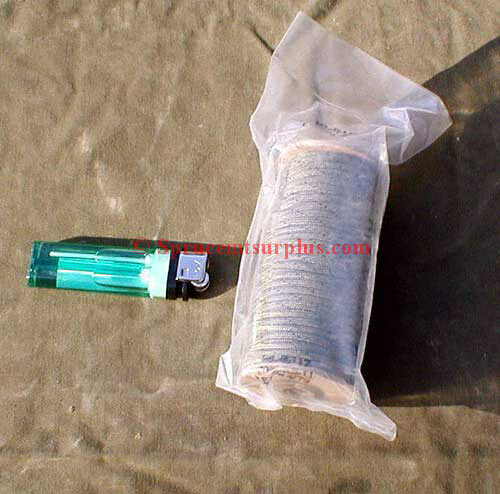 New stock mfg by Doan Machinery and Equipment, Inc.
Food packet, survival, general purpose. Mfg by Oklahoma League for the Blind in 1988. 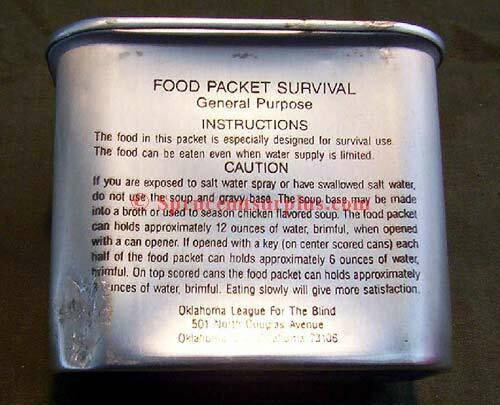 Vacuum-packed can with pressed corn flake bars, instant soup or tea and sugar packs. New old stock. Just a few left. Goggle, sun, dust, wind. NSN 8465-01-004-2893. Current Mfg. 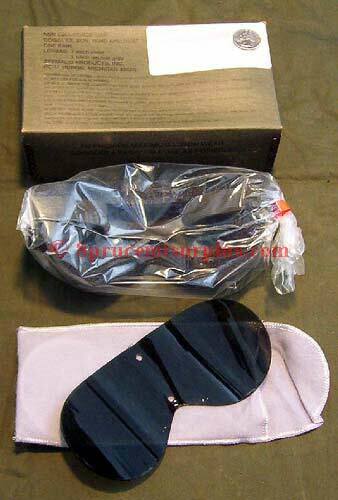 NIB with extra lens. 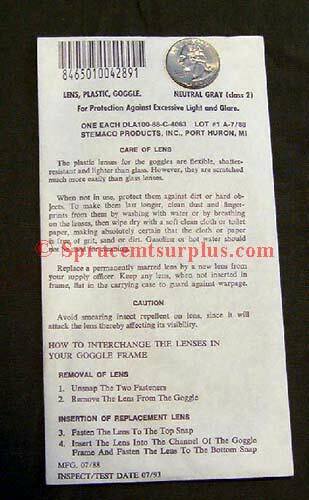 Mfg by Stemaco Products Co.
Goggle, ballistic, with 1 ea clear and 1 ea neutral gray lens. NSN 8465-01-328-8268. New old stock. 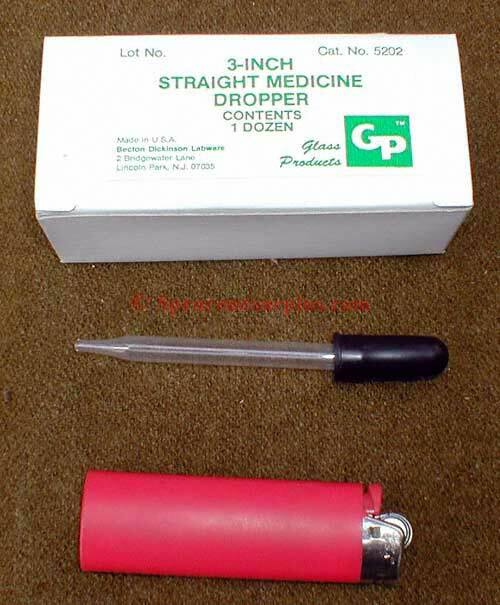 Mfg by Stemaco Products Co. Call for priceing on current mfg. 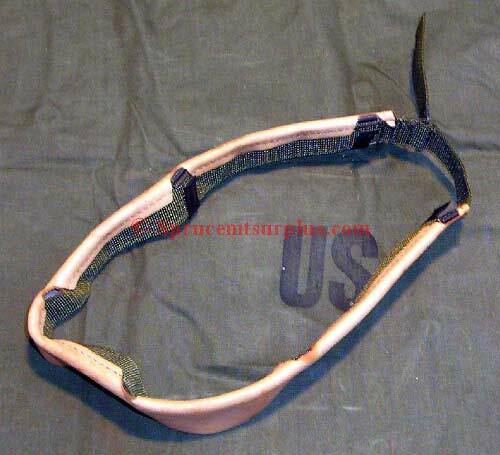 Frame, goggle, without lenses, with headband strap. NSN 8465-01-103-1354. New old stock. 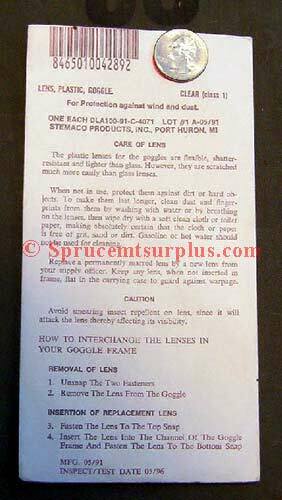 Mfg by Stemaco Products Inc.
Clear lens for sun, wind and dust goggles. Current issue. NSN 8465-01-004-2892. 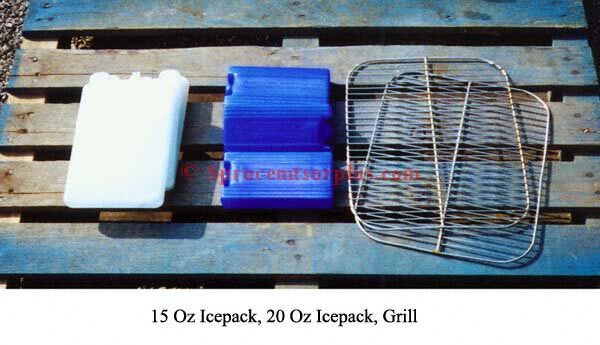 Plastic Class 1 Mfg by Stemaco Products Inc. 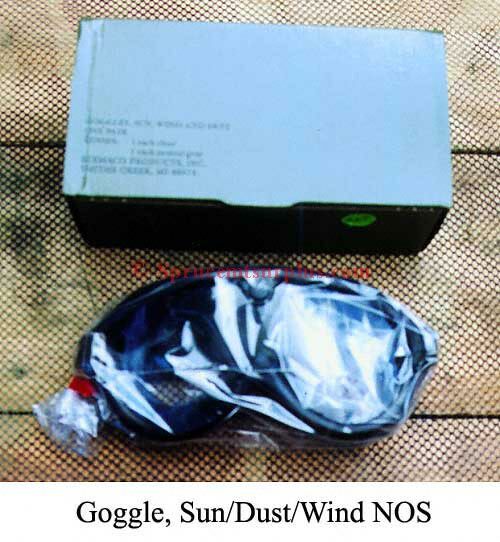 Neutral gray lens for sun, dust and wind goggle. Current issue. NSN 8465-01-004-2891. Plastic, class 2. 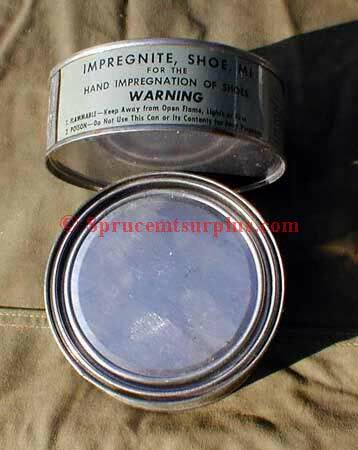 Mfg by Stemaco Products Inc.
Impregnite, shoe, M-1. For the impregnation of shoes. NSN 535510. New very old stock. Packaged March 1945. 8 oz can. Excellent condition. 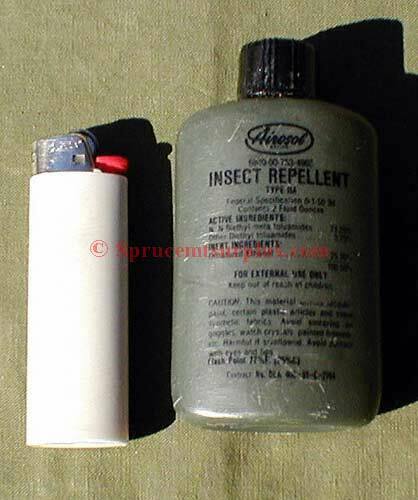 Mfg by Natural Oil Co.
Insect repellent. 2 oz Plastic bottle. NSN 6840-00-753-4963. 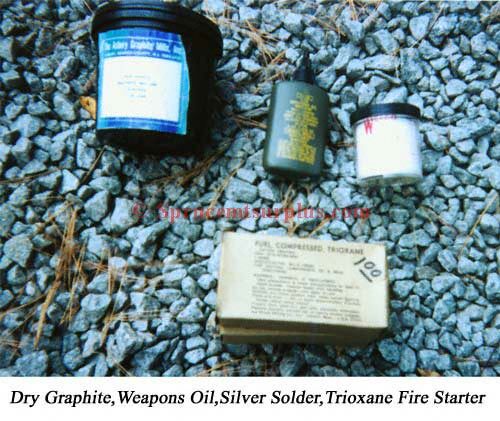 Mfg by Airosol Company Inc. New old stock. 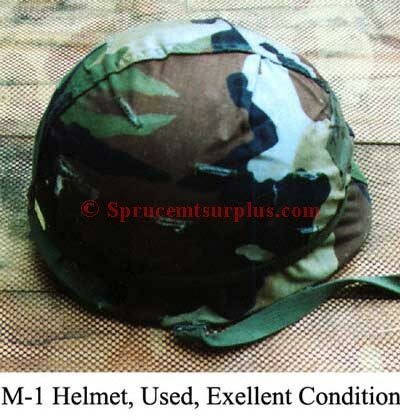 Helmet, M-1 Kevlar. PASGT. Size Vary. 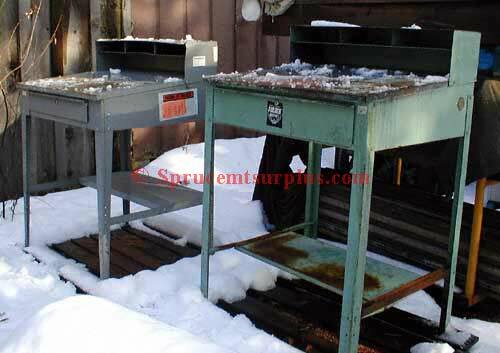 Mfg by Devils Lake Sioux Mfg. And others. Call for availability. Suspension assembly, GT/Para. NSN 8470-01-092-7518. Medium. New old stock. 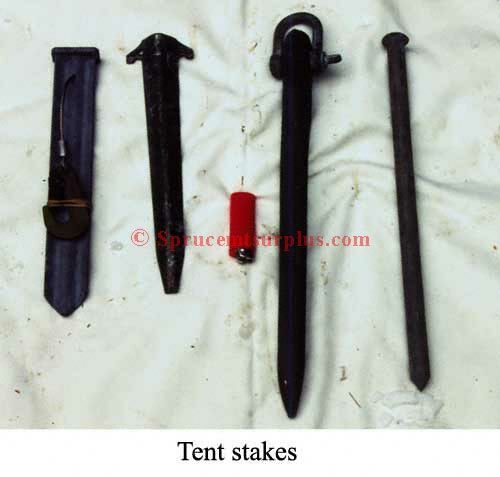 Cap, cold weather, insulating. OD Green. 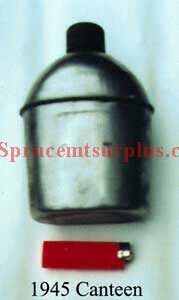 NSN 8415-00-782-2919 and others .New old stock. 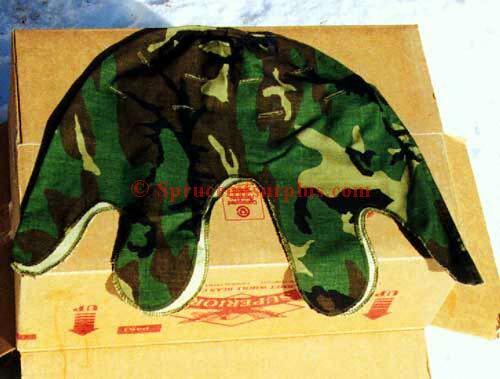 Mfg by M&B Headwear Co. and others. Sizes available are 6.75, 7, 7.25, 7.50. 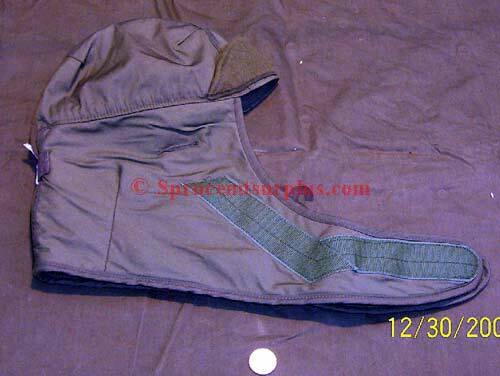 Headband, helmet liner. NSN 8470-00-153-6671. New old stock. Mfg by Steinberg Bros Inc and others. Liner, fiberglass. Complete, used good condition. 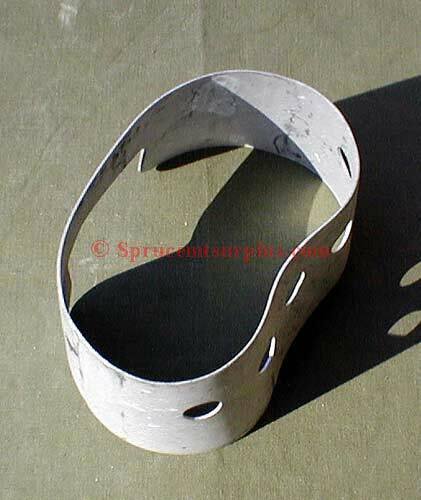 Suspension, helmet liner. NOS. NSN 8470-00-880-6814. 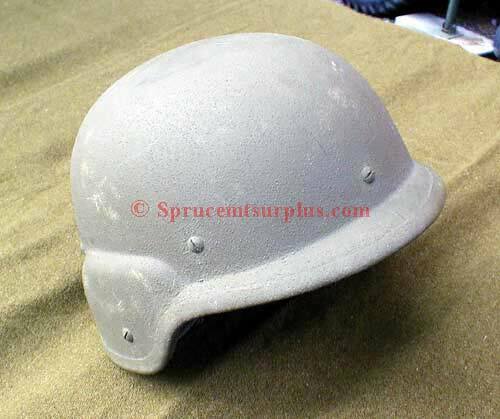 M1 helmet assembly aka as steel pot with liner. Complete, used condition. Complete masks are not currently available. 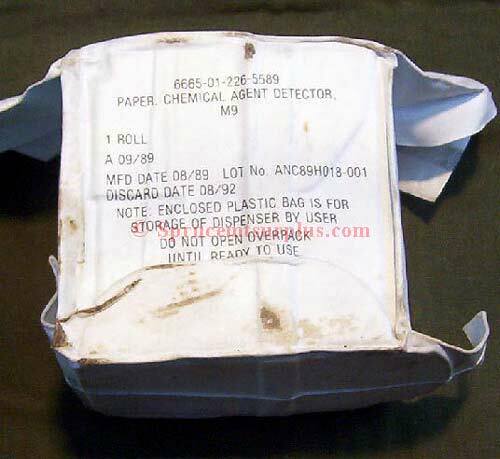 Filter element set, chemical-biological mask, M13A2. For M17 and M17A1. NSN 4240-00-165-5026. New old stock. 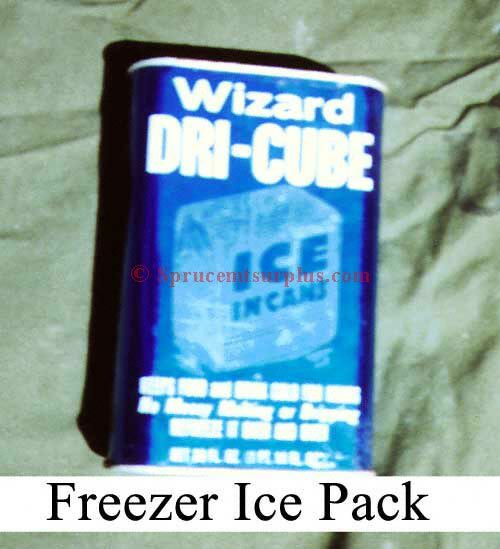 in original sealed package. 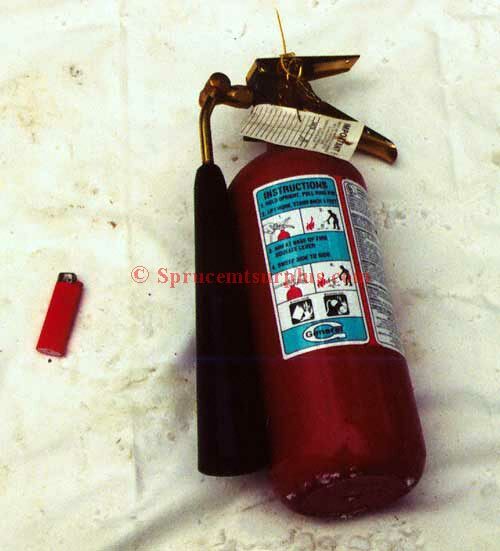 Mfg by Mine Safety Appliances Company and others.